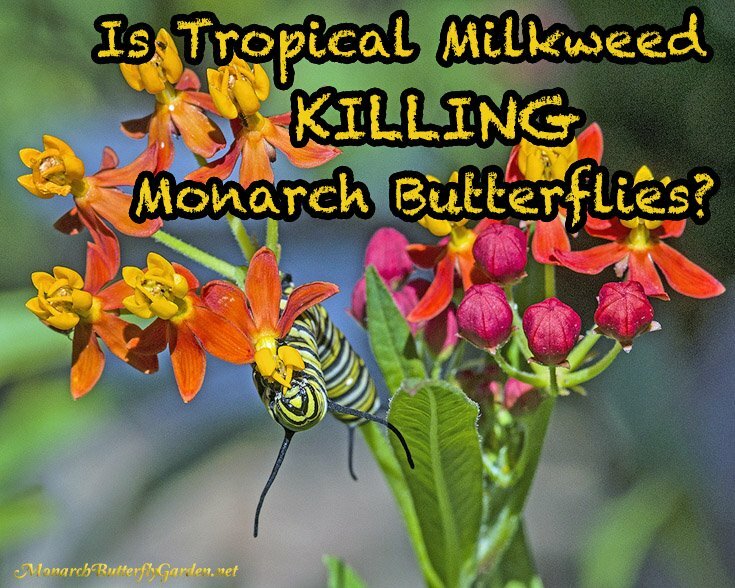 Home » Is Tropical Milkweed Killing Monarch Butterflies? 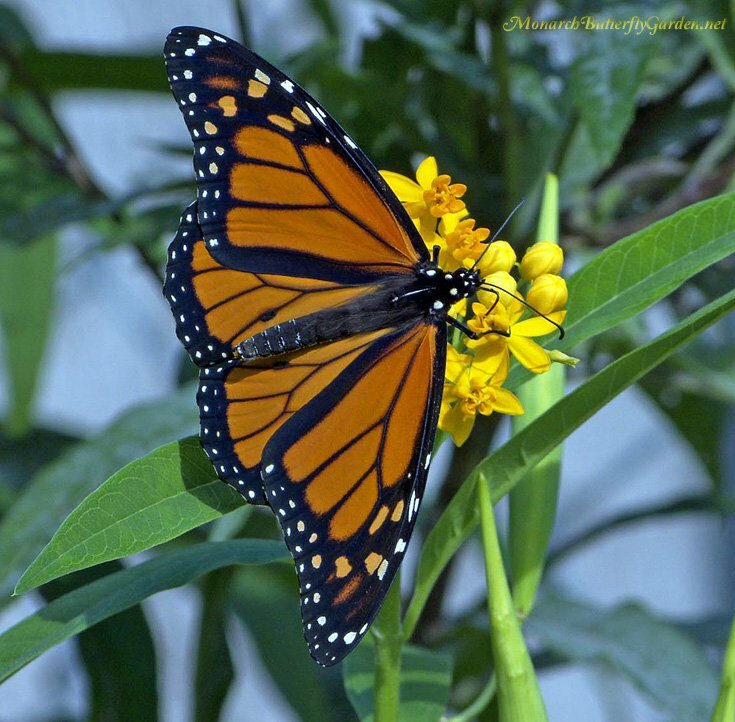 Another monarch migration is on the horizon some of us still have a gardening question weighing heavily on our minds…will I hurt monarchs if I grow tropical milkweed? Tropical Milkweed(Asclepias curassavica) is a non-native milkweed that has exploded in popularity over the past decade with both North American butterfly gardeners and the objects of their desire…monarch butterflies! Popular nectar plant for butterflies…especially around the fall migration! Unfortunately, it didn’t take long for native purists to magnify potential problems for adding this new milkweed to our garden landscapes. While there are relevant issues that deserve further research, this milkweed has endured an unrelenting smear attack over the past few years. Somewhere along the way, non-native naysayers stopped acknowledging any benefits to growing Asclepias curassavica. They even started trying to position it as monarch enemy #1a, right along side the ultra-controversial buddleia davidii (butterfly bush)…but that’s a post for another day. “When tropical milkweed is planted in the coastal southern U.S. and California, these plants continue to flower and produce new leaves throughout the fall and winter, except during rare freeze events. While these issues are still being studied, some are calling for a moratorium on tropical milkweed and lesser known non-natives that could potentially pose the same threat. This is a potential problem for those in US coastal regions including Florida, Texas, and Southern California. We still need conclusive data on this issue to understand how the reuse of tropical milkweed is negatively impacting the monarch population. Overuse isn’t an issue with native milkweeds is because the native leaves are only viable/desirable during the earlier parts of their growth cycle. The leaves of non-natives like tropical milkweed and balloon plant (Gomphocarpus physocarpus) stay viable from first leaf until first frost. Texas Butterfly Ranch reported that a tropical milkweed research patch left overwinter in San Antonio had an occurrence of 15% OE…however, other monitoring sites observed by the Monarch Larva Monitoring Project had 47%! This is 6 times the OE levels of the monarch population returning from Mexico. A Tropical Solution: Gardeners in tropical milkweed perennial regions (USDA plant hardiness zones 8-11) can cut it back to the ground a couple times each season. 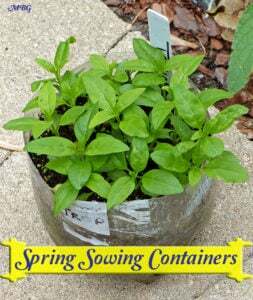 This will allow fresh, healthy foliage to emerge for new generations of monarchs. When to Cut Back Milkweed? : I get this question a lot, and I’m not sure there’s a perfect answer. You’re looking for a lull after a flurry of activity, but these times aren’t always obvious. Try staggering your cuttings (cut back half now, the other half a few weeks later). This way, there’ll always be some milkweed available for unexpected monarch visitors. A Tropical Solution: Once again, cutting back milkweed plants (or potting them to bring indoors) can make a huge difference. If viable milkweed plants aren’t available to receive monarch eggs, this should encourage the monarch majority to finish their Mexican migration. However, it’s important to note there is currently no conclusive data telling us if/how much this is happening. 2016 Update- with more gardeners planting tropical milkweed, the overwintering population in Mexico grew 3.5 times: from 57 million monarchs…to 200 million! If you believe this, then I invite you to plant tropical milkweed to see the truth with your own eyes. A Tropical Solution: I don’t see a problem here but non-native plants are best used for complementing your natives…not replacing them! 1. Bring it indoors– once monarch season is over in your region (or should be) bring your pots inside so any late comers won’t be tempted to continue the season in (too) cold weather. For the past 5 years growing tropical in Minnesota, late egg laying has never been an issue. It would seem the monarchs are taking other environmental cues to start their fall migration. Also, if tropical milkweed keeps monarchs from migrating, then why don’t the butterflies stay south of the border where they would have tropical milkweed growing year round? An added benefit to potted plants is that they can be overwintered indoors. This will give you fully mature milkweed plants to start next monarch season…and cuttings to start new plants! 2. Raise Monarchs on Milkweed Cuttings– raising monarch butterflies is an awe-inspiring experience, and a much simpler one using potted milkweed plants. By raising them indoors, you can potentially raise their survival rate from under 5%….to over 95%! 2016 UPDATE: we still plant tropical milkweed containers, but we only take stem cuttings for raising indoors because they are easier to clean and keep predator-free. So, What’s Your Tropical Milkweed Verdict? If you’re gardening in USDA hardiness zone 7 and below, it’s highly unlikely you’ll be dealing with overused milkweed or fall-lingering monarchs. But if you want to be 100% sure your tropical milkweed isn’t negatively affecting them, you can take the same cut-back precautions in your northern garden. For those above zone 7, your answer isn’t a difficult one…are you willing to cut back your milkweed or bring it indoors to avoid overuse and migration tampering? If the answer is no, stick to natives and avoid contributing to these potential issues. If you are willing to take simple precautions growing Asclepias curassavica, then it can be a valuable asset for attracting and supporting monarchs inside your butterfly garden. By growing tropical milkweed responsibly, you’ll be helping more monarchs in a time when monarch support is crucial to the survival of their storied migration. We live in SW West Virginia (Jackson Co.). I am very interested in plants that will benefit the Monarch butterflies. Could you please steer me towards info on the Monarchs ?? They are beautiful creatures and would love to do my part to increase their lives . Do you know what year this article was written in? I would like to cite it for a report. On 60 acres in north Florida we have lots of native milkweed on which I have never found a Monarch. On my tropical, I raise and release about a hundred Monarch up to October when I cut back. I know at least a hundred take flight because of Tropical milkweed. I am planning my monarch habitat for next spring. I have come to the conclusion, a variety of milkweed is the best way to go. yes Linda, we have around 15 species growing in our garden every season and most of them are utilized by monarchs at some point. Having milkweed that peaks at different times can make a difference in how many monarchs you attract/support through the season. I have a question. The milkweed in my yard in SE Georgia is entirely tropical milkweed. I saw at least a hundred caterpillars, but all seemed to become Lizard Lunch. Lots of lizards on the plants and no pupas formed. I saw pupas only on a pot of milkweed which I put on top of a birdbath. Prairie Moon Nursery offers several varieties (e.g., A. hirtella, A. stenophylla, A. incarnata, A. tuberosa and A. verticillata) which might grow here. Do you have any advice on which species might cause feeding caterpillars to be unappetizing to lizards? I haven’t seen birds on the tropical milkweed, but bird predators might also be an issue. Thank you. I have a hearty patch of Tropical Mikkweed in my yard in Houston. We had a real issue this year with wasps. Through the spring and early summer, we had plenty of butterflies visiting, but never seemed to find larvae. There were little lizards patrolling the milkweed daily. And, I watched wasps bite into 5th instar larva and destroy it. We made up for it after Harvey, when almost 50 larvae were counted, and yielded 41 cryssalis on my patio. That would explain more success for predators. If the milkweed doesn’t make the larvae taste yucky, the deterrent is gone. After a few successful meals, predators learn there is no reason to avoid feasting on monarch larvae. Hi Lara, tropical milkweed actually has higher cardenolides than most other milkweed species so it is more toxic. The issue in your region is that it’s continuously growing so it needs to be cut back because pathogens and OE spores can build up on the plants…unfortunately, many predators seem to have adapted to the toxins in all milkweed. Hi Tony — I have a question about how you know when your little Monarch caterpillars have wandered off the milkweed because it’s time to pupate, or maybe they just got lost and are just slowly starving. We have a few of those white nylon mesh butterfly habitats (the Caterpillar Castle) and sometimes the milkweed leaves or branches touch the mesh walls of the enclosure and the caterpillars just climb up the branch … and then keep on climbing. They get onto the mesh and then climb up the wall and end up on the roof of the butterfly habitat. If they’re large and plump I assume it’s their time and they’re starting the chrystalization process. But sometimes they’re just small little fellas and I worry it’s too soon, they’re not big enough to be ready to make the transition and it’s more likely they just got lost and wandered away from the food source. The trick is to know whether to bother them or not. If they are hanging upside down, well obviously they’re well on their way, or if there are silks around them and they’re beginning to attach themselves in place, well duh, I get it. But sometimes a small caterpillar may just be a late-season guy who will end up as a small butterfly. OR — he could be lost and starving and can’t find his way back to the milkweed leaves. The way we have it set up, he’d have to climb all the way down, then to the middle of the butterfly habitat floor, then up the vase and back onto the milkweed plants, which is not very likely. They need to be eating constantly at this stage, so a lost and hungry caterpillar is a sad thing indeed. But it would also be terrible to pick up an already-pupating caterpillar and remove him from his location of choice and put him back where he started on the milkweed plants. How can one know if a small caterpillar is just lost and hungry and needs a helping hand, or if he’s just a small dude on his way to becoming a small butterfly and we should leave him the heck alone? Hi Dan, sometimes they crawl away to molt (they shed their skin 4 other times before forming the chrysalis). if they can crawl from the leaf to the roof, they should have no trouble finding the milkweed again. You can position a leaf closer to where they are, but I would not move them. They can sit for up to 24 hours before they molt…they usually eat their old skin afterwards. I’m in Central Florida. Zone 9b. Master Gardeners tell us to cut down our milkweed in October – up til now, not for OE, but to encourage migration. Recently there was an article in a local paper ridiculing those of us raising Monarchs, the premise being that Florida monarchs do not migrate, are not on the migratory path, therefore it will make zero difference in the big picture. See the contradiction there? I am an avid gardener, have a yard of primarily native plants (am trying to do the right thing for the environment). The a. Curassavica was represented to me as native. It grows fast and aggressively here. I have begun to cut the seed pods off as soon as they develop because the plant is sprouting all around my yard – I believe it will eventually be classified as “invasive” here, as use of it is already being discouraged. However. Nurseries in the area do not have native milkweed. I’ve made three attempts to grow native milkweed from seed, and have so far had no success. It is delicious to snails, and doesn’t make it past the seedling stage. I’m making the fourth attempt with seeds kept indoors, and so far, so good. I keep up with my tropical milkweed, keep it cut back, and I use a mild bleach solution on the leaves I feed the cats (when I briefly stopped cleaning them with bleach, a large majority of my monarchs eclosed with deformities). Because it is so prolific and the seeds can fly so far away, I am concerned by the tropical milkweed that is accidentally growing wild in this area, of it coming up where no one will cut it back. I have a friend who wants to “Johnny Appleseed” the milkweed to “help” the Monarchs, which – with all I have learned about OE – is a terrifying plan, one that she will hopefully decide against. I don’t think Tropical Milkweed is the correct variety to scatter to the winds! All this said in hopes that anyone in my area who doesn’t know these details will see this and use extreme care with their Tropical Milkweed and the seed pods until such time that the experts: the scientists or … – – until “they” can say definitively that a. Curassavica is safe (or tell us to destroy it completely because it is BAD). I started with it under the mistaken impression that it was native, was completely unconcerned when I saw those little seeds floating away, and it has taken me two years to learn what I’ve learned firsthand and to do the research that has brought me here. Tony, I am with you in your belief that it can be used by those willing to take the steps to keep it safe and clean — and contained. If I didn’t have Tropical Milkweed, I’d have NO milkweed. I am, however, concerned that the largest majority of people are unaware of the risks that come with Tropical Milkweed — because the first year it was growing in my yard, I was! I do actually have a question, though (climbing down from my podium, here). Am I correct in thinking that OE is only on the surface of the plant? Is it possible that the plant could be infected systemically? I am concerned about this because I had cut my plants down, I had almost entirely new growth, I was feeding with the leaves from that new growth. And yet I had horrifically deformed butterflies when I fed without disinfecting. This has really given me pause. Hi Terri, thank you for your thoughtful comment. First, central and south Florida have a year round population of butterflies so it stands to reason that some don’t migrate. However, there needs to be research to discover whether there are migratory monarchs from your region, and how many. Keep in mind, monarchs that were tagged in California have been recovered in Mexico, disproving the theory that all western monarchs migrate to coastal California. Perhaps people should be encouraged to tag in Florida to see if any of those butterflies are also recovered in Mexico. As for your deformity issue it’s hard to say: OE? disease? bleach ingestion? As far as I know OE spores are ingested on egg shells and the outside leaves and stalks. When making changes to your process, change one thing at a time, so you can be sure of what’s affecting your success. good luck! You can buy native Florida milkweed at native plant nurseries around the state. I do not understand why so many are concerned that milkweed is available AFTER mating & egg laying. Adult Monarchs require nectar from flowering plant sources for survival and milkweed nectar is not the only plant that supplies it! There’s a plethora autumn blooming flowers that attract Monarchs & many other butterfly species: asters (like New England, New York…), goldenrods, sunflowers, coneflowers, Autumn Joy sedum…. For instance, goldenrod flowering coincides with Monarch migration. There is a reason and it’s not just by happenstance. It also supplies end of the year nectar for numerous other butterfly species, insects, bumble bees, solitary bees and is a pollen source for bees. Dead flower heads of goldenrods, asters, coneflower…supply food for seed eating birds during winter. Goldenrod Gall fly larva overwinter in the plant stems & supplies a winter food source for some woodpeckers. There is a bigger picture here and it almost seems like this article and some commenters are advocating tropical milkweed as an the option to support Monarchs, almost defensively. There is such a thing as plant diversity and offering choices, more important than any one single plant. Hi Linda, we grow showy and stiff goldenrod (which monarchs rarely visit), 4 types of sedum, and New York Asters along with many other native plants. Too many native-only gardeners are trying to push ultimatums that just aren’t necessary. “There is such a thing as plant diversity and offering choices, more important than any one single plant.” I agree! I am referring to the tropical milkweed that is cutback and encouraged to regrow & re-bloom outdoors (according to some) AFTER eggs have been laid, collected & everything has been taken indoors. There is no reason that this particular milkweed needs to re-bloom simply to supply nectar to adults. There are many, many plants that produce nectar after milkweed is done blooming, natives & non-invasive non-natives. I feel that anyone re-growing tropical milkweed after rearing caterpillars, is being somewhat irresponsible, maybe selfish. It almost seems that re-growing this plant for another bloom or two is more important than Monarchs themselves. The way I see it, tropical milkweed re-growers are putting adults that are spore free & migrating south at risk of becoming infected by luring them to one’s newly re-bloomed milkweed, not guaranteed to be “clean”. Native milkweed is usually done blooming, at least for the most part at this time, so adults are most likely not landing on spore infected plants. These autumn migrating Monarchs now carrying dormant spores can infect other plants (as quoted below) during their travels and will lay infected eggs when arriving at your house the following year. Even worse, these females will lay infected eggs on wild native milkweeds but no one will be there to disinfect their “babies”. Spores on milkweed don’t move to new buds and shoots. They don’t jump onto adult butterflies. They spread from adult butterflies to caterpillars by being shed near or on eggs and being ingested by the caterpillars. I am currently reading Monarchs and Milkweed by Anurag Agrawal.. He says Monarchs instinctively switch preference to the tropical milkweed when they are infected with Oe, because it is higher in cardenolide concentrations, means greater sequestration, reducing the spore load in the larvae. they put themselves on medication. its a great book, but very science orientated. We live in the Bay Area of California and launch 20-50 monarchs from our kitchen every year with only two or three that fail to thrive or fail to launch. We take great pains to get any OE spores off the leaves of our Mexican Milkweed when we bring it inside to feed to our little guys, including dipping the cuttings in 5% bleach solution, then rinsing before feeding, and doing the same with the eggs on the leaves (which amazingly does not seem to harm them at all). My question is can we get away with just thoroughly rinsing the stems and leaves under a strong cold spray of water from a shower-head spray, and “squeegeeing” each leaf between thumb and forefinger under running water — that should physically (not chemically) remove any OE spores, right? I mean, they’re not embedded, they’re not glued on with superglue, and they’re not kryptonite, right? The problem is that sometimes on a busy workweek when you’re running off to work in the morning and you have time to cut and rinse some fresh milkweed for the Hungry Hordes, but you may not have time to get out the bleach and the big stainless steel mixing bowl and rinse everything clean and mix up the 5% solution and do the whole rigarmarole, and then clean up the whole assemblage … so instead of doing nothing, can we just use a strong shower-head needle-spray of cold water and use fingers to wipe off anything that might be on the leaves? Hi Dan, in our northern region I only rinse with water and we never have issues with OE. I assume this gets off a high % of spores, but I’m not sure how effective it is compared to bleach…this is an experiment for someone in a continuous growing region. I would try cleaning cuttings with water first. But, if you are having problems you’ll need to consider adding bleach to the process. good luck! Actually, I have a question. I have several tropical milkweed plants. I also have a large population of small lizards. I live in SE Georgia. I have seen many caterpillars but never a pupa. The large caterpillars seem to disappear. I’m sure the lizards eat some/most because I have seen them on the milkweed plants. Today I saw a very large caterpillar eating a hole in a green milkweed seedpod. Later in the day that milkweed pod had split and the caterpillar had disappeared. I’m wondering if some caterpillars have started pupating within milkweed seedpods in order to be protected from predators. I have seen at least 10 split green milkweed seedpods. Has anyone else seen very mature caterpillars feeding upon green milkweed pods and causing them to split? Thanks. Hi Margaret, butterflies need to hang to dry their wings when they emerge from a chrysalis so pupating inside a seed pod would not work…seed pods split when the seeds are mature. Hi Randy, OE would be a potential issue for your Calotropis species too, because it’s a continuous growing plant in a continuous growing region…I have not seen the ‘white’ monarchs personally, but have seen photos. My understanding is that up to 10% of the butterflies display this genetic deviation…pretty cool! I Live in zone 7b and maintain a school yard butterfly garden. This is our 2nd year and this year we planted A, Currvassica. It has been very popular for the Monarchs and their egg laying. Our areas “usual fall migration” monarchs come trough around September and we released in the early days of October. The tropical milkweed was not cut back. I kept thinking I would do it and propagate the cuttings. but then…..
November 4, 2016 my 1st grade students and I notice monarchs visiting our tropical milkweed. I think to myself, surely there wont be any eggs at this date. Sure enough, we have 45 eggs. Night time temps are in the 40’s. 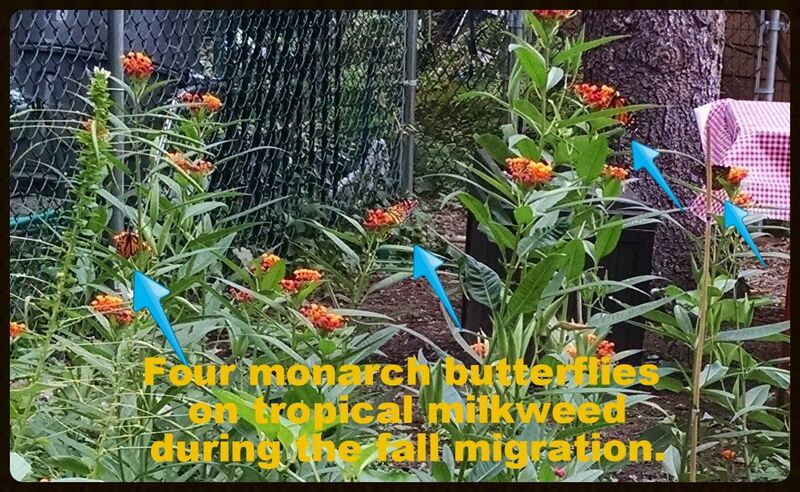 From your information and others, I believe we should start to cut back the milkweed (or bring indoors) after that “initial fall migration” so that “late in the season egg laying” would not occur on our plant? I fear my experience my support the tropical milkweed “nay-sayers” I don’t want that. I think our success this year was because of A currvassica. We do not see many monarchs going north, only the fall migration. Most native species of milkweed are spent at this late date save A incarnata. So the tropical milkweed is awesome for our garden and situation. I think we should be most worried about insecticides, Roundup and Spectricides, killing our pollinators. That’s the true threat to our bees, butterflies, and caterpillars. Having read over this twoyear long thread, I was rather annoyed by the few defenders of science who display a non-scientific attitude. Skepticism over scientific results is healthy and essential to the process. Science is presently in a state of crisis due to its failure (p-values [probability values]to replicate). The failures are widespread and so severe that some scientific journals no longer accept results based on the old standard of p-values. Science relies on statistics but very few scientists know enough about statistics. ‘s authority, which is a logical fallacy, not science. Science indeed can only disprove hypotheses. The success of science is the long trail of detritus–theories and hypotheses that failed to be true. Decision Science, Maryland. We grow 75 tropical and 500 swamp, showy, and common. So far we know we fed 2 Monarchs on their way north 4-6 weeks ago–that’s it–no eggs or cats. At the time, the only milkweed we had blooming was tropical. We have found no eggs and haven’t seen a Monarch since. Swallowtails are also down compared to the feeding frenzy we had become accustomed to. I feel like planting this species that far north wouldn’t contribute much to and issue in continued migration, with such a short season the stragglers or cats that pop out much later than they naturally would, would just freeze. I believe the concern is lies in growers planting it far south, where it won’t die off. This is not some miracle plant, however. Though the pace at which curassavica grows is amazing, in mild climates I would HIGHLY advise that growers cut off any follicles. This can be a somewhat noxious weed here in the SF bay area, even with the climate being essentially the opposite of what the plant would naturally experience. (Or at least as far from it as frost-free areas of the US get) The plant can even establish in a non-cultivated setting here, I wouldnt be too surprised if it would be locally banned or regulated at some point. (Banning things is pretty much what this state does best) I shutter to think how this would take over in the south-east or other more tropical climates… And yeah, the plant won’t die back or have any cession of the bloom cycle in these more mild/southern climates, which I believe is where the major concern lies. I have a few questions. I just started raising butterflies and am still learning. In S Florida, can we use tropical milkweed year-round without bringing them indoors? Or do I still need to cut them down? Hi Barbara, lethargic and spitting green liquid is a symptom of pesticide exposure.You might want to cut back your milkweed plants to about 12″ and let healthy new growth emerge. Since you are in a continuous growing region, cutting back plants also removes built up OE spores on plants. Good luck! I’m no scientist, but I am a completely organic gardener with emphasis on natural habitats for birds, beneficial insects, and especially Monarch butterflies. 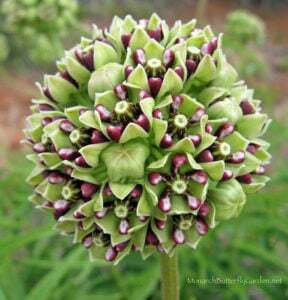 Having grown up in coastal New England, I am well versed in the native milkweed, asclepias tuberosa being the most common there. I have moved to southern Florida where I luckily have wild milkweed on the property. I have been raising Monarchs and hosting eggs, caterpillars, chyrsalises, and big beautiful PERFECT butterflies. When I saw that the winter months did not slow down any Monarch activity, I knew I needed more milkweed to meet their voracious demand. I asked the local nursery what they recommended. It was “tropical” milkweed, asclepias currasavica. I bought 50 plants. IT WAS THE WORST MISTAKE I HAVE EVER MADE. Yes, many eggs were laid per plant, yes the caterpillars devoured the plants, loved it. I garden in Victoria, Texas on the Texas Gulf Coast, midway between Houston and Corpus Christi. When you say our tropical milkweed plants should be cut to the ground do you mean that literally or maybe leave 3 or 4 nodes above ground and be certain to remove all leaves? Just today I cut back to about 12 inches but was reluctant to cut further as I still have at least a 5 or 6 ts on my 8 or 10 plants. I generally cut my plants back every 2 to 3 months , generally to control aphid from spreading to adjacent milkweed plants. Curiously for all the butterfly activity around my plants I have never seen a chrysalis. The bed is backed by a chain link fence covered with morning glory and passion vine so perhaps they are just well hidden. The cats seem plump and healthy. Hi Linda, there is not an “absolute” right answer to the question. The longer you leave continuous growing milkweed plants to grow the more OE spores they will collect (assuming you are attracting monarchs). Some suggest cutting plants all the way down toward the end of October to encourage butterflies to finish the migration. Others stagger their cuttings so there will always be some milkweed available in case of an emergency. Your system sounds fine. The goal isn’t to be OE free, but to greatly reduce the number of spores so that your milkweed supply can support healthy butterflies. If you raise indoors, rinsing off milkweed also helps. I have a large yard with over 100 tropical fruit trees and I also keep bees and so I started planting some extra nectar plants for them and then remembered that monarchs like milkweed as it seems do all the nectar eating insects and so I planted one tropical milkweed. Which has now gone to seed and I have been spreading the seed in different areas of the property that I do not mow. I have two questions: 1) I guess these seeds do not need the layering cooling technique described for other varieties?? And what other varieties would U suggest I plant in S.W. Florida where I have swamp if I want to use it. And where would I get those seeds?? Thank U.
Hi Robert, all you need to do with tropical milkweed is direct plant in your region (no cold stratification necessary). As you know, it seeds a lot so it may become invasive. You can always cut off seed pods prematurely (and pull existing plants) if it gets to be too much. I planted tropical milkweed (just labeled milkweed at the nursery) in my garden in New Orleans and now I’m worried because there are at least 10-15 caterpillars and lots of crysalises all over the garden. I don’t want to cut back the plant because then the caterpillars might starve, but I don’t want them to get stranded here over winter. We probably won’t have our first freeze until late december, and who knows… it might be a temperate winter, but I just can’t stand the thought of all those potential butterflies freezing to death in their crysalises. Should I cut back the plant now? Should I just cut back the flowers and leave the leafy lower part? I don’t want the bugs to starve, but I don’t want them to keep breeding either. Hi Julia, you can always stagger cuttings over time so that there’s always some milkweed available, but it all gets cut back eventually. You could also raise them indoors and pick/refrigerate the remaining milkweed leaves and use as needed, or use stem cuttings. Thanks so much! The caterpillars are very large and will be cocooning themselves soon. It might be pretty easy to bring one of the plants inside and take care of them that way. I will probably do that if it looks like there is going to be a cold snap. I’ve cut back several plants, and only one has flowers left on it. There should be enough leaves left for the caterpillars to munch on in the meantime. Hi, I have been raising Monarchs in my backyard for the past couple of years with what I thought was good success… 60-75 seemingly healthy Monarchs both years with a couple of cripple butterflies, maybe 5 chrysalises that turned black unevenly and never hatched. Most of the Milkweed I have is the Tropical kind. I live about 30 miles from the Gulf of Mexico in the Panhandle of Florida. Could you give me an idea of when Peak Migration occurs here and when I should cut my Tropical Milkweed back to prevent the spread of OE? Had over 30 monarch chrysalis last December here in louisiana. A mild winter. When should I cut back my Asclepius curravassa? Hi Susan, try staggering your cuttings (cut back half now, the other half a few weeks later). This way, there’ll always be some milkweed available for unexpected monarch visitors. I have been planting many tropicals all around my house in NW Mo. for several years, with much success. Last year was excellent, and during their migration south for a period of several days I had an amazing abundance of dozens of Monarchs feeding on my flowering plants. I feel it is more important now than ever to provide waystations for them with the growing popularity of GMO crops in this area that make it easier for farmers to eradicate weeds with herbicides, further diminishing native milkweeds. This past Spring was cooler and wetter, and I had fewer seedlings sprout, and an abundance of caterpillars that severely denuded the surviving plants, resulting in far fewer seeds for me to gather. Now that they have moved on, my plants have re-flowered, and hopefully have been pollinated. My main question is with first frost rapidly approaching, can I take flowering cuttings in the hope of them going to seed while overwintering under my growlights? I live in the Bay Area in California – I am a novice – just started raising Monarchs this year. I successfully raised and released over 300 monarchs. I have about 50 milkweed plants – Yellow Ascepias and Asclepias curassavica. Monarchs flooded my garden the day I planted in May. Eggs were laid on both types of plants. The females laid eggs on the healthiest plants and it seemed that they also laid more eggs on plants that did not have the large seed pods. As of now I have 20 chrysalis and 20 caterpillars close to pupating. I have 4 eggs and no monarchs in my yard for the past 4 days. So, the Monarchs seem to be noting the time of day is changing and heading out. I am learning as I go and I have learned so much from websites like this one. While I think it is a good idea to plant native plants I also see the benefit of the tropical milkweed and cutting them back, but without even cutting them back the Monarchs are gone. At this point I 90-95% make it from egg to BF. I use the pots with mesh cages. I also discovered using one of the round mesh laundry containers works great to put over a plant in the garden. The paper wasps really took out a lot of Monarch initially. Thank you all for your thoughtful comments and for caring to be involved. I live in north central florida, when should tropical milkweed be cut back? Hi Pat, now would be a good time if your activity has slowed. You can also stagger the cuttings so you have milkweed available if you need it. We live in South Florida. Like Bermuda, our monarchs don’t participate in the migration, so I just feed them whatever they please and protect the caterpillars. Unlike Bermuda, ours arrive because they got lost and then decided to stay. Like a lot of people! Down here in Zone 10b we also have a native giant milkweed, a 9a – 11 host plant/tree. Some Monarchs prefer the tropical milkweed, but some prefer the giant. I try to give them a variety. I ordered some other milkweed seeds to give them a go, but I’ve been told not to expect much success. Thanks! I appreciate your insight and I sure hope you are right! Please help. I live in San Antonio Texas and have been growing tropical milkweed in my part sun/part shade garden for several years. Until this year, they have been lovely and gorgeous. This year, however, none of my plants are blooming. I have the original plants that I planted from the nursery, and, now, I have dozens of “volunteer” plants that have sprouted on their own. Again, though, none of them are blooming. Or, if they are, something is eating the blossoms. Please help. Thank you in advance. Hi Michele, up north I have noticed that the younger plants always look healthier. I would stick with the volunteers and have new plants for next season. They may not be flowering because the seeds germinated late. I would be surprised if your new plants aren’t flowering before the end of the season. If I bring my potted milkweed plants indoors for the winter, do I still water them and keep them in a window? OR do I try to make it go dormant by putting it in the dark and not watering it? Please give me some tips on HOW to bring it in during the winter. Hi Gabrielle, thank you for taking the time to share your experience, and also for your thoughtful reply…always appreciated! I live in Santa Cruz CA. We are a winter destination for Monarchs. I live a little over a mile inland from the Monarch Sanctuary at Natural Bridges State Park that is by the beach. Over the years (I have lived here well over 30 years) we would go to the Sanctuary in the winter to see the immense amount of Monarchs all in clusters hanging from the eucalyptus trees. I hadn’t visited in quite awhile so my last visit a couple years ago was a shock. The clusters were so small, with a few flying around. Where did they go? I started to research the issue found the sad answer and I was then compelled to create a butterfly garden as I now have space for it. I knew nothing about how to grow for Monarchs, I always assumed they were doing their thing over there in the sanctuary, so I found some seeds for tropical milkweed online, I bought them and started my garden. I got monarchs immediately, I was so excited, I posted my success on a nextdoor.com website for our neighborhood and I shared pictures of Monarchs in my garden with my neighbors. They got excited too (most posts are usually about the drug and theft problems around here, so happy news was a welcome relief) I got requests for seeds from my neighbors so I packaged up saved seeds from my tropical milkweeds and zinnias to give out for free. Then on the website someone in the neighborhood who was a retired docent from a local wetlands sanctuary started posting objections to my seed distribution, same issue, about growing non-natives. I didn’t even know this was a concern, so then I researched the California natives, most are highly invasive (yes as roadside weeds they are fine, but not great for a garden) I did find that heart leaf milkweed is a non-invasive native, it grows naturally up in the Santa Cruz mountains, but I am in that area that isn’t the beach and not up in the mountains sort of a foothill area maybe. I started heart leaf milkweeds, they are hard to start, my one plant is small, it is nice and it will if it survives it will be a beautiful plant. All around it are tropical milkweeds, both the orange flower and the showy red, they are doing great and I do get frost in the winter, late in the season, last year the frost wiped out my tropical milkweed, though now most are coming back and the reseeds are sprouting too. I too last year had very late season caterpillars on my tropical milkweed, I found two in early December right before a storm was coming in so for the first time in the few months I had be growing milkweed and spotting Monarch caterpillars in the garden, I brought them inside. Luckily the frost was not until almost the end of Dec. so I had milkweed to feed them, they went into chrysalis a little before Xmas and stayed in for quite some time. They emerged about mid-January, the weather was still a bit cold, so I kept them indoors for about a week, I gave them oranges, homemade nectar and I found them some nectar plants at the nursery, Calendulas and primroses. I was very concerned that they would have some food during the winter, luckily the weather got a bit warmer, so I then took them to the Monarch sanctuary and released them, The eucalyptus trees were in bloom and all of their kin were there… what little is left of the vast population that used to visit that is. I stopped by the ranger station before leaving, they had Monarchs in various stages in their rearing environment, they had tropical milkweed in their garden and they had various types of milkweed for sale, mostly tropical milkweed. I told the ranger that I was raising milkweed in my garden, she thanked me, with a very sad look in her eyes, it is very desperate now. The population here in the West coast is in such a decline and we in the Monterey Bay area are known for the Monarchs, it is intrinsic to our culture and it is in a sad state. We went to the event the sanctuary had mid February to say good bye to the migrating Monarchs, but most were already gone and there were so few to start with, there were barely any left. It is heart breaking and why I will do whatever I can to help. But not all of them leave. This year I have released eight, one more will emerge soon, I spotted a Monarch in my garden today. I have three kinds of Milkweed, tropical, heart leaf and swamp. My catz love the tropical especially the flowers. My micro-climate is actually better for the tropical, being warm but somewhat wet (coastal fog) than for the native (heart leaf) that is better up in the mountains where it is hotter and dryer. I love these little creatures, they are so adorable at any stage, I have lost some due to my inexperience, but I thank Tony for his book I bought, I was able to figure out my mistakes and my success rate has vastly increased. As to the theory that tropical milkweed is hurting Monarchs, I say Horse-Pucky! Yes there are some concerns, but if one is aware of the Monarch cycle, and depending where you live the concerns can be minimized, and the fact the the Monarchs themselves pig out on it, I will say, thank goodness we have it!!! There is room in my garden for native and non-native (though according to a post above, tropical milkweed is now considered a native for California, YAY!) I am applying to have my garden considered to be a sanctuary for Monarchs and I need to have a minimum of three types of Milkweeds and a variety of nectar plants. And I don’t stop at Monarchs, I have been raising Gulf Fritillaries on my passionflowers and Painted ladies on my malvas. I have seen a great increase in natural populations of checked and orange skippers and then there are the cabbage whites. I used to get rid of them because they were destroying my cabbage and broccoli, but they are butterflies, so now that I am trying to be a sanctuary, how can I kill them? I don’t, I have a special patch of fast growing brassicas that I relocate the caterpillars to and still have my cabbage. Thank you again for this site, for this conversation, it is so valuable to have a place to learn from and discuss the concerns on this issue. Thanks for your story. I live in the Sacramento Valley and am very new to the Monarch situation. Last year I bought 3 milkweed plants. Showy, Swamp Milkweed and tropical. The tropical produced seed so I threw them in one of my beds last winter and planted the others. Later I bought a couple more tropical. The tropical are doing fantastic. I would occasionally see a Monarch but I did not get eggs or cats. Late in September this year I started to see a Monarch every day. They seemed to prefer the tropical milkweed, but also nibbled on some butterfly bushes and Chitalpa tree blossoms. I am getting seeds from the tropicals like crazy, enough to share with my daughters 7th grade science class and to scatter in a natural area adjacent to my neighborhood. I intend to cut all the milkweed back in a couple weeks gathering as many seeds as I can. Hopefully I can begin raising cats next year. In the meantime I will be boning up on how not to spread oe and keep my milkweed supply free of it. I think that awareness is key and that all of us who love the Monarch would never intentionally hurt it. It is in trouble and we can all do our little parts to help. Thanks Tony G. Great Article and great feedback. Hi. I’ve got only one tropical milkweed and I live in Florida. It’s in the ground right now but I put planted it in the ground about 1.5 weeks ago. I had a monarch caterpillar on it which sadly died after going into his J position. I’ve seen monarchs on it and I think they’ve laid eggs because I can see them. I’m thinking about taking it out of the ground and potting it so I can have more control over it’s care and I can move it indoors when the caterpillars start going into their J position. Is that a good idea? to put it into a pot? I plan to do it very carefully but I don’t know how sensitive the plant is, I wouldn’t want it to get damaged during the re-potting. So i’m debating. But it’s not in the best area to contain a chrysalis, so in a pot I’ll be able to move it and protect it more. Thank you. Hi Danae, if you want to establish a garden outside, I would suggest a minimum of 6 plants to a patch…one monarch can eat an entire plant over a 2 week period. Right now, I would concentrate on building up your milkweed supply for future monarchs…good luck! I have the Tropical Milkweed and it worked great last year and I had a lot of Monarchs emerge from it. So no it’s not bad. They love it! So Tropical is a GO. THANK YOU! I have been harassed to no end by my native plant groups to which I belong and am on the boards. I have remained steadfast in my scientifically based approach to “growing the herd” by following all the steps that you outline. Sure, We can be purist and completely loose the species. This year I released over 300 monarchs, and my neighbor released over 100. We tagged 200. I definitely have > 95% success but then, I collect the eggs every evening. I love this hobby and feel that this is one activity that can make a difference in the outcome for this miracle on wings. I live in deep south Texas, about 30 miles from the Mexican border. I want to grow milkweed plants to attact the monarch and other butterflies. I had pentilas growing along the entire side of my home and we got beautiful butterflies, my grand kids really enjoyed them. I had one plant right outside our toy room window, my grandson got to see hummingbirds just inches from him, on the other side of the window. But they did not survive a cold snap we had. Now I want to some milkweed. Will they grow well in my region? Hi Ana, check out some of the milkweed options on the link below. Each listing has both native and perennial growing regions to help make the best choices for your garden. Is O.E. a problem in Mexico where tropical milkweed is native? On that same note, if the mere presence of tropical milkweed can send monarchs into a mating frenzy and disrupt their migration, according to alarmists. Then why do the monarchs ever even bother leaving Mexico? It’s warm, they have an abundant nectar and food source year round. I’m reading many articles on the potential problems with tropical milkweed. In southern California where I live, it is the variety of milkweed that is available at my local native plant nursery. I bought several of them and they bloomed great this summer and lo and behold in the fall a female monarch laid eggs. We are now approaching mid-December and our monarchs have just now entered the chrysalis stage – they are outside in various places in our backyard. Do they have a reasonable chance of surviving? Do I cut back the milkweed plants or do I let them remain as they are? California experienced its warmest year on record and I am wondering if monarchs are now going to shift to overwintering in places like southern California? Any thoughts? This is what woke me up last night: If, according to alarmists, the presence of tropical milkweed promotes off season breeding, then why isn’t there an off season breeding problem in Mexico where the tropical milkweed is native? 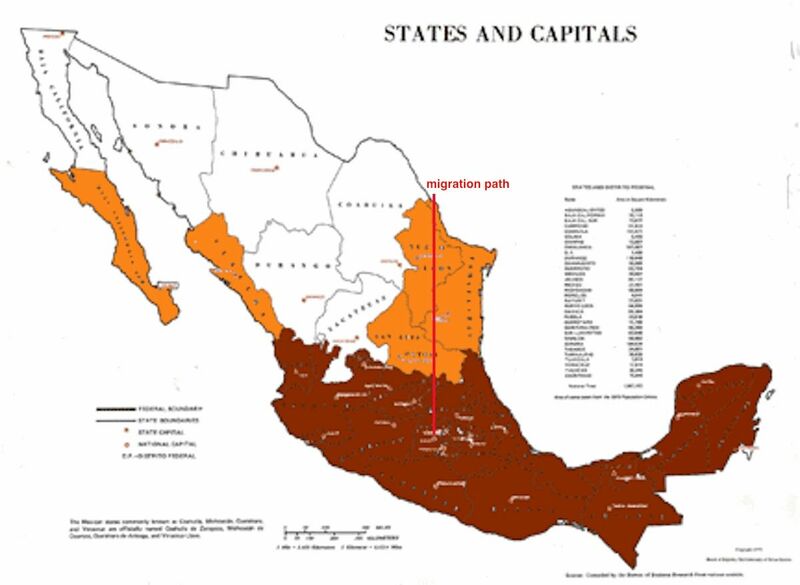 Also, if having resources readily available disrupts migration, then why do the Monarchs ever bother coming back North, if they are surrounded by native tropical milkweed in Mexico? SoCA. This year I purchased over a dozen native milkweed in 1-gallon pots to start the switch from tropical to native. The Monarchs preferred the tropical and ate it to the bare stems (on over a dozen plants in the ground) before turning to the natives. Eventually the natives were eaten back and have not recovered. The tropical is starting to leaf out again. Re: OE – hard to believe it’s a problem in plants that are eaten to the bare stems twice a year. Re: migration. 25 years ago a university physical geography professor warned the class I was in that if measures were not taken to control global warming, we faced multiple challenges in our physical world. So far I’ve noted that EVERY ONE of the events he warned about has come to pass exactly on the timetable he laid out. One of the events was the shifting of weather, with my Southern California climate becoming warmer and more humid. Such as has happened (his example – and well under way – was the loss of our pine forests to the pine beetle because the winters are no longer cold enough for a long enough period of time to kill off the larvae). I suspect we are seeing a similar shift with the migrating Monarchs not needing to go all the way to Mexico (where, I assume, their native tropical milkweed is found). I plan to plant more tropical, not less, now. Debi, I agree that the climate is changing and planting for normal weather patterns 50 years ago, will not be successful for many in today’s extreme environment. If your plants were eaten to the ground, healthy new growth should emerge for the next monarchs to start their life cycle. I try to encourage people to diversify their milkweed, because having more varieties helps to insure you’ll always have viable milkweed that’s ready to support monarch life. I wonder if it is possible for the drought conditions to add to the OE increase? In this paper, female monarch butterflies infected with OE parasites preferentially deposited their eggs on tropical milkweed vs Swamp milkweed. The tropical milkweed monarch larvae ended up with lower parasite loads! OE-infected or non-infected monarch caterpillars, if given a choice between Swamp or Tropical milkweed, didn’t prefer one or the other. This careful study, if replicated, should be considered as evidence that tropical milkweed has its place in the complex survival arsenal of monarch butterflies as an anti-parasite strategy. thanks for your comment. It’s frustrating to hear so many people believe that just because a plant has potential issues, means it should be condemned and not even considered as a potential solution for supporting more monarchs. And, as you point out, there are even potential benefits for improved monarch health with tropical milkweed. It’s also fast growing and easy to propagate…aren’t these important qualities in a time when loss of habitat is decreasing the milkweed supply? Hello! I find this subject very interesting and worth more study. What I can offer are personal observations made in the milkweed patches on our property in NE CO. To begin with I have stands of A. tuberosa, A. speciosa, A. incarnata and also grow the non-native A. curassavica. We don’t usually see any Monarchs until it’s time for the Methuselah generation and by then even the Swamp Milkweed is becoming tough, however, the Monarchs still prefer to oviposit on those plants over all others. I always water the plants with a sprinkler early in the day to wash away OE spores and carefully check plants for eggs as soon as I see Monarchs in the gardens. The eggs are always left on the Swamp Milkweed leaves and brought indoors into sterile containers where I can monitor their progress. If there is enough good quality Swamp Milkweed I will use it instead of the tropical variety until after the first instar, and then they are fed almost exclusively on Tropical Milkweed. This year the Monarchs were later than usual and I had to feed with tropical early on and must say there was some mortality of young larvae but no more than what I’ve seen in years past. The vast majority made it to eclosion and all of them were large, strong and gorgeous specimens. I’ve not noticed any difference in cut or potted plants and both the swamp and tropical are easy to pot up for placing indoors but need to be rinsed and inspected for tiny predators (spiders and ants). I’ve not ever seen any Monarchs stopping to reproduce instead of migrating because of A. curassavica, in fact, the Methuselah totally ignore the Tropical Milkweed here and nectar almost totally on the native crownbeard, Verbesina encelioides. I also want to give this plant a big thumbs up for its great service to late pollinators, including the Monarchs. It is the latest nectar plant on our property and can withstand light frosts. This year was my latest sighting for the Monarch and a couple were observed on Oct. 26 nectaring on crownbeard. Since then the plants have frozen and our season is over. I think it’s important that we all work together and learn from each other’s successes and failures. Scientific studies often take years and years, but the Monarchs need help NOW, so until there are definitive answers to some of the questions posed it seems we should try and share our experiences so as to benefit a species so adored and loved by all. Hey, here’s a shout-out to Angie Luebben…….YOU GO GaLl!!! Char, thank you so much for sharing your personal experience with milkweed gardening and raising monarchs. Your thoughtful comments are much appreciated! When do you recommend cutting milkweed back in the fall? I just had a monarch lay eggs on my milkweed today and I’m not sure what to do. I live near mobile bay in daphne, AL (zone 8b). Thank you for your help. Hi Jessica, in your region this should be fine. If you raise monarchs you could always cut back your tropical now and use the cuttings to feed these final monarchs. Otherwise, they should probably be OK outside too. I would cut back your milkweed after peak migration in your region, or if you have other late season nectar flowers you could cut back now. Congrats on getting monarch eggs! I planted a couple hundred A. curassavica indoors for 2014, along with a few dozen A. tuberosa, and some A. incarnata, and we let the A. syriaca come up all over our Minneapolis garden rather than trying to limit it to one area. The A. tuberosa and A. incarnata have done poorly, with many plants just not surviving and the others being quite small in their first summer. The A. syriaca was great for the monarchs, but it looks untidy. The A. curassavica is robust and beautiful. I gave away many plants to people who wouldn’t have been willing to deal with A. syriaca. After raising one set of caterpillars in the early summer, we let nature take its course; there have been monarch butterflies in the garden constantly. Now, during the migration, a constant stream of monarchs and hummingbirds are visiting the flowers on the A. curassavica. They seem to prefer it to all the other nectar plants in the garden. I will keep trying to encourage the A. tuberosa and incarnata, and will continue to let the A. syriaca run rampant, but for consistent fall nectar production, ideal balance of robustness and manageability, and eye appeal, the A. curassavica is the real winner. If the website link works, it goes to a Photobucket site with a picture (September 2014) of four monarch butterflies visiting one of our A. curassavica patches at once. Thanks for your insights Mary! I have all 4 varieties in our Minneapolis garden too. This was a banner year for incarnata and I’m still feeding our caterpillars with it. But for a nectar source, tropical is the only game in town at this point and it’s a favorite fueling station as the monarchs migrate to Mexico. Your photo is fantastic! I live in the Antelope Valley in California. As of now, I am unable to find native asclepsia californica seeds available, so I have planted asclepia curassavica. When do you recommend that I remove them? Hi Colleen, in places where tropical milkweed grows year round more precautions should be taken to decrease potential spread of disease and to encourage the fall migration. You don’t need to remove them, but consider cutting them back to the ground in late winter/early spring and fall. good luck! I have common milkweed and it really spreads, the thing is that it gets too tall and falls over and it also gets the little mites on the leaves and I worry that it will kill the monarch caterpillar. Is this infestation dangerous for the monarchs? Hi Ethel, after your common milkweed is done blooming you can always cut it back a couple feet and it will put out fresh growth….this should also keep it from falling over. If milkweed leaves get infested with bugs or start looking diseased I would cut back those parts of the plant and discard them. It is difficult to know where to start when responding to this article. If I say anything against the writer’s view I am Automatically a ‘native purist’. While the Monarch butterfly is not in danger of extinction, the miraculous migration is definitely in danger of extinction. To prevent the extinction, we all need to work together. Calling folks names, especially those who could or should be on your side, does not move things in a positive direction. This afternoon, I walked along several miles of roadside in and around the Austin, TX area looking for milkweed, I found hundreds of plants already growing. There are thousands of miles of roads in the Monarch breeding area, If each has hundreds of plants that makes hundreds of thousands to millions of existing plants currently available to returning Monarchs. How long do you suppose it would take to achieve this degree of planting if you are using tropical milkweed in your personal gardens? I say go ahead and plant your tropical milkweed, but more importantly work to alter the roadside mowing in your local area to protect existing stands of wild milkweed. Protect these plants until after the seed has set and spread, and until after the chrysalises have hatched into adult Monarchs. Long term, we need to alter the wide-scale spraying of Glyphosate (active ingredient in Round-up). But that is going to take years, years that we may not have if we do not work together, now. We will not be able to work together if we begin the conversation with name calling. respectfully, a native plant enthusiast who pragmatically plants non-native tropical milkweed, in urban areas……. Hi John, it was not my intent to insult native purists, but it is my belief that the small percentage that refuse to see any benefit to growing tropical milkweed are doing so largely because of their purist point of view, and not because of logical conclusions resulting from careful research. I have grown sick and tired of having my ethics and morals questioned because I choose to grow some non-native plants in a controlled garden setting (in Minnesota!). I try not to stoop to name-calling and I think I do a pretty good job. I agree 100% with your comments, and I’ve never suggested that planting tropical milkweed in roadside ditches is a viable option. However, there are a lot of gardeners unable or unwilling to grow some of the more unruly milkweed varieties in smaller spaces. Too many times I’ve seen and heard the native milkweed ultimatum telling people it’s their responsibility to save the world, and that they’re obligated to plant these varieties wherever possible. I am coming from another angle. I am trying to help people discover their best milkweed options, that in the process also help the struggling monarch population. There are issues with growing both native and non-native milkweeds. I reveal what those issues are and if/how they can be dealt with. Then it’s up to the gardener to decide if a milkweed or nectar plant will work for their particular situation. Is this a perfect solution? Absolutely not…but I think it’s a solution that more people are open to hearing since they’re not being told what to do and judged for it when they don’t comply. I agree that there are more issues growing tropical milkweed in your region, but why isn’t anyone trying to figure out ways to accentuate curassavica’s benefits, while minimizing its problems. The writer slams those who prefer to use native plants in their garden. There is no reason for the writer to use derogatory, insulting terms such as “native purist”. That puts people on the defensive, & doesn’t help at all. The whole tone & the writers bad attitude for people who may have a different view point, is a turn off. People need to work together to save the Monarch. Name calling builds walls, not bridges. Hi Deanna, I have nothing against native purists and, as long as someone takes responsibility for the plants they grow, it’s their choice to decide which plants are best suited for their garden…native or otherwise. My point is that I think some native purists aren’t open to discussing options other than tropical milkweed removal. Since lots of people are still growing tropical milkweed, discussing how to grow it (without potentially harming monarchs) is an important conversation to have. Native Purist is an insulting, derogatory term. You know that, & yet you continue to use this term. This gives the impression you’re a mean spirited person with a bad attitude. You should be more responsible with your words & be more respectful of other people’s opinions that are different from your own. There are many people in this country who like native plants & have them in their landscapes to benefit the insects they have evolved with for thousands of years. They consider this to be good for the environment & are selfless gardeners. I have many native plants & some ornamentals, yet I am tolerant of others who have a belief that is different from mine. Your entire article is filled with hatred & name calling. It’s completely unnecessary. So what do folks who are into purely native plants want to be called? We have to have a “label” to distinguish the various types of gardeners. I too grow Asclepias curassavica, in Mid-Missouri. They seem to really like it, and it is the only plant we have that I’ve found eggs and caterpillars on. Our garden is small, so many of the true natives just won’t do in our garden. Hi Deanne, I think tropical milkweed is a good option for smaller gardens because you need to maximize your space with long blooming, viable plants. I have yet to hear a convincing argument about why tropical milkweed shouldn’t be grown in annual regions, but it’s certainly a hot-button topic. I try to offer people options instead of ultimatums, but some people have issues with the responsible gardening approach. I’m not sure what native milkweeds you’ve tried, but you might want to consider swamp milkweed or one of it’s cultivars. Have a fantastic season! I am an avid native plant supporter, being on the board of Midwest Native Plant Society and Greater Cincinnati Wild Ones. My yard is a testimonial to native landscaping. I remove invasive non-native plants almost every weekend. I am letting you know all of this information because I also wish for you to know that I also use the non-native milkweed to promote large numbers of monarchs. 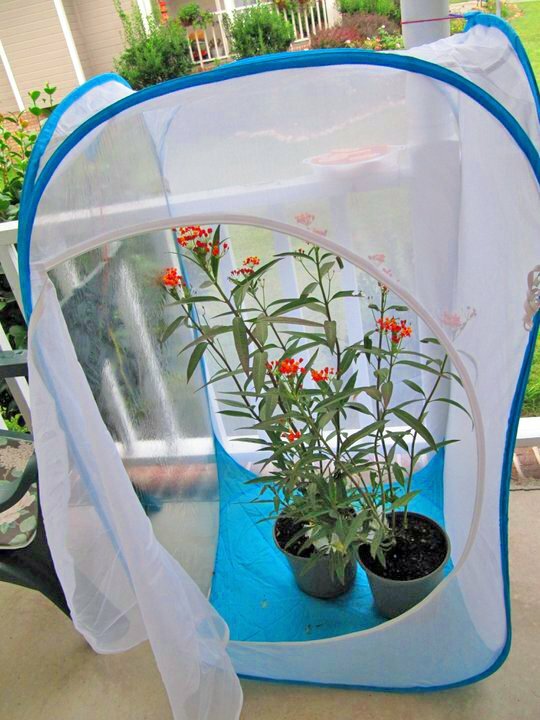 I have had significant success in raising monarchs by using this plant in my protocols. It does not pose a threat in SW Ohio. I also check for OE and I raise the cats on native milkweed. I only ask that we not alienate gardeners that would like to explore more natives but are hesitant due to the attitudes of purists. There is room for responsible diversity. Hi Debi, I appreciate you posting this. When I read the first sentence, I was bracing for another attack about how non-natives are destroying the environment and not supporting the native ecosystem. I wish more people were open to trying new solutions (which need to be considered in this day/age) when we are losing native habitat on a daily basis, and will only continue to lose more. I wholeheartedly agree that native plants are the cornerstone to a successful garden, but that some non-native plants can also be very helpful in our common struggle to support monarchs and other beneficial pollinators. Every year monarchs use ALL of our 15 milkweed species at various points in the season, and so do other pollinators and native wildlife. Because of this milkweed diversity we see and support many monarchs throughout the season. I agree that “responsible diversity” is a reasonable goal in a garden setting. I will continue to post more info on both natives and non-natives so that our community understands all the options, and then can make the best decisions for their particular situation. Hi Scott, the immediate issue I see with this research is that syriaca isn’t a viable speices in late summer and fall because the leaves are too tough…it’s an excellent early milkweed though! And as far as the cardenolide levels, could high levels also be a potential benefit because the monarchs would be more poisonous? Last season, I found four instar 5 cats on my physocarpa plants…those have higher cardenolide levels than curassavica. Was this because predators somehow knew they were more poisonous? or was it because they were unfamiliar with this non-native milkweed and didn’t know to search for caterpillars? The research is definitely “lite” but makes sense from an evolutionary standpoint. Where tropical milkweed is native, the Monarch doesn’t migrate so the size and strength of the butterfly doesn’t matter as much as it does to its northern migratory variety. I actually like tropical milkweed and have planted it three seasons in a row here in Maryland. Each fall it seeds abundantly. We capture the seeds and let the pods dry out over the winter. In the spring I just spread the seeds around after the last frost and they grow just like wildflowers! Monarch’s appear to prefer the tropical over the local Common by a 4:1 margin measured by where I find the eggs and caterpillars. The Tropical does last a longer than the Common but I think that is nature’s way of telling the Monarchs to move on. I can’t argue that tropical lasting longer than the Common is a benefit if the Monarchs artificially wait around longer. Evolution has devised its plan over millions of years and we are possibly interrupting it in just a few. I am going to plant tropical again this year after thinking long and hard about it this winter. I am going to attempt to measure and weigh the butterflies to see if there is a difference at least in my very small sample though and if there is I will not plant it again. It will be a great science fair project for my kids. I am also going to cut the tropical down when the common turns yellow. I think keeping the tropical around just to extend the milkweed season is akin to keeping the trash can lid open to let the racoons eat. This is a good topic and I appreciate the input people are adding. This study was in Minnesota, so I’m not sure I agree with your hypothesis, but perhaps this could become an issue in southern regions of the US. I have raised monarchs for over 30 years. In the past decade, I tend to raise more around migration time because most of my gardening projects are finished for the season. Those last monarchs are mainly fed tropical milkweed. They are (without a doubt) larger than the monarchs I see (or raise) earlier in the season. In some years, I have had viable tropical milkweed for WEEKS after the monarchs have migrated. They’re not staying around for the milkweed and are obviously taking other cues to start their migration. I will continue to monitor this in 2014 and beyond. But, for 5 years… there have been NO issues. Since we’re playing seniority cards, I’ll toss in mine. 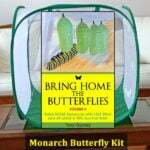 I have raised monarchs since 1969. If you’re going to compare tropical to another milkweed, compare it properly. Raise the caterpillars on live plants. Raising the caterpillars on cut leaves proves little since that method takes tropical milkweeds inherent problems out of the equation. Eating uncut tropical milkweed takes extra work on the caterpillars part. Danaus erippus, the southern monarch, evolved with tropical milkweed. Their caterpillars eat differently when compared to Danaus plexippus plexippus, our migrating monarchs. D. erippus learned how to deal with tropical milkweed. D. plexippus plexippus has not, which causes problems, mostly during the 1st instar. Kevin, I raise caterpillars on leaves, cuttings, and potted plants. I don’t ever have problems with first instar caterpillars, perhaps because I rinse of all my leaves or spray plants/cuttings daily. My survival rate is always between 95-100% and the few that didn’t make it over the past few years have all been from predation or freak accidents. I’m really glad you addressed this. Recently, after reading on the butterfly garden forum some posts that sounded rather alarmist, I started reading about this issue. After reading the article you referenced and others, I came to the same conclusion you did. I am in zone 7a/6b and I plan to continue growing tropical mw along with my native mw. However, I am wondering, is it possible that I would perpetuate any OE that might be on my tropical mw on the cuttings or plants that I bring in to overwinter? The “potential solutions” involve humans. Once humans quit tending the tropical milkweed or the tropical milkweed escapes into the wild, there is no solution. It’s too late. The potential problems and solutions surrounding tropical milkweed both involve humans. Not everyone is going to fall in line with a natives-only solution, so I’m not sure why you’d chose not to educate people on how to deal with these potential issues. curassavica for 100+ years (the white portions of the map represent desert areas that are too dry for currassavica to grow in the wild). See, that is what I thought – it is a native plant in their home range. I can see why folks might be concerned about OE, but for most gardeners growing this lovely gem, I don’t think it becomes a big issue. Hi Deanne, I am still holding out hope for tuberosa….I even moved some last year to see if a new spot makes it more inviting to the monarchs. Almost every report I receive from gardeners is that tuberosa is one of the worst host plants for monarch eggs. As a nectar flower, I’ve heard better things about it and hope I’m able to report some success with it this season. Good luck with your garden! My experience too – monarchs avoid the northern USA type of tuberosa. However, they do use the tuberosa that grows wild in the southeastern States like Georgia. I have not investigated whether or not the southeastern tuberosa is a subspecies or not of the northern tuberosa. I live in the Los Angeles area and have had only good luck with Asclepias tuberosa, the only variety I have been able to find in the local nurseries. My five large plants were found by Monarchs almost immediately, and so far I’ve raised 7 Monarchs, (4 females, 3 males). I don’t know why tuberosa has been called the “worst host plant”. It works for me. Hi Bill, Southern California is different because of the year round monarch population and drought conditions. With less options available, monarchs take advantage of milkweed when they can find it. They often bypass tuberosa for milkweed with more substantial foliage in other parts of the country. If Tuberosa works for you in California, keep on doing what works. Have a fantastic season! I liked your comment about hands down the Monarch like the Tropical plants. Because the Monarchs here in So. Cal like the Tropical plants over the Native Woolies that I have. And last season I had only ‘1’ successful Monarch make freedom. The rest were deformed and sick. All from the natives. On the other hand, the Tropical plants have produced strong, live, healthy Monarchs. Plus, the baby catz love the flowers produced my the Tropicals. Go Figure. I was under the impression, since I live in the Houston area, that the only milkweed that does well here is the tropical milkweed. I didn’t know about the controversy but I do cut mine back a couple of times a year to encourage fresh new growth. I’ve also had some sad experiences with December Monarchs including a female whose wings didn’t unfold fully and never flew. I helped her by hanging up a sponge which I dipped in sugar water and refreshed often. She clung to that walking up and down the string to take sips of the nectar. When freezing weather was predicted I brought her and her nectar sponge indoors and set up a retreat in our spare bathroom for her where she lived two more weeks before passing. I’ve got some tropical milkweed seeds started in pots and the outdoor plants in our front garden are putting out new growth. What other varieties are recommended for the Houston area? Hi Jayne, tropical milkweed may very well be your best performing milkweed in Houston, but milkweed diversification will give you opportunities to cut back your tropical so it doesn’t get covered in OE disease spores. 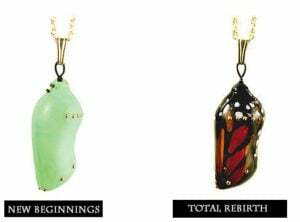 When monarchs hatch with deformed wings, this usually indicates high levels of OE. This is a list of some of the potential milkweeds you can try in your region…I’m sure some will be more successful than others. http://imageshack.com/a/img839/268/nmim.jpg By the late 1800’s monarchs were a common butterfly on the island. Paul, you are quite the monarch historian. Thank you for providing all this info and the links. Are you saying that two wrongs make a right? 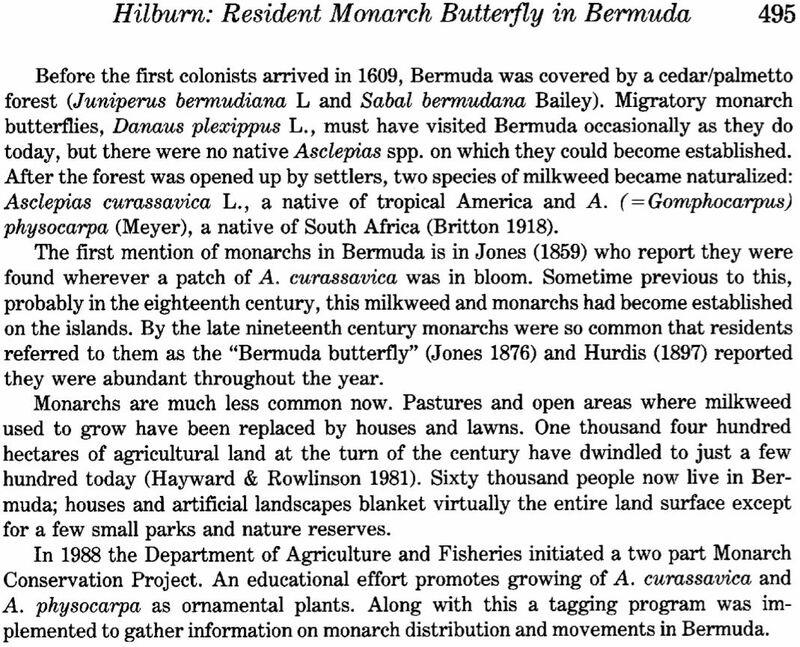 Where is the logic of introducing, both milkweeds and monarchs to Bermuda, Australia and New Zealand? We made those mistakes in the past but we are learning now to respect local ecosystems. Introduced species have multiple impacts on the biotas disrupting the normal functioning of the ecosystem and affecting the local flora and fauna. Let us keep destroying ecosystems to preserve one charismatic species. Is this your argument? Oh, I forgot to say that I live about an hour north of Atlanta, GA. When my last two monarchs emerged in December, there was nothing blooming. So I kept them alive on diluted sugar water for about a month and was hoping they would make it to spring since they were supposed to be in Mexico over-wintering. Hi Penny, I think other people have tried overwintering them too. I’m not sure of the success rates but I’m guessing you would need an environment similar to what they experience overwintering in the wild for optimum health…glad to hear you will be cutting back your milkweed this season. Thank you so much for helping me on the decision of how to handle this issue. Last fall I had tropical milkweed growing and had a monarch lay a lot of eggs on it. At the time I didn’t know there was a controversy about it. I was just so excited to watch her lay eggs and then watch the metamorphosis of the caterpillars. I photo-documented everything I witnessed. Well, in late November I found some chrysalises hiding in my asters. It was going to be freezing the next day so I brought them inside. A few days later I had 2 monarchs to emerge. I kept them alive until the end of December and then they died. I don’t want this to happen again, so I have several species of native milkweeds planted and hope they come up this spring. I planted the tropical milkweed because it was what was available in the few nurseries around here that even carried milkweed. And I have to admit it is a beautiful color and attracted all kinds of insects. If I grow any more of the tropical kind, I will cut it back. Hi Penny, sorry to hear about your December monarchs. Over the past 30 years raising monarchs, I’ve also learned some painful lessons that resulted in monarch deaths. What has always bothered me about the tropical milkweed issue, is that none of the potential solutions are discussed. It’s either that you stop growing it, or you’re morally and ethically unfit to garden. There are simple changes we can make to reap all the benefits of tropical milkweed without these negative issues. I hope more people are willing to stop giving ultimatums and start discussing viable options. I think more people will be willing to listen then and we can all get back to helping save monarchs and their amazing migration. While there is plenty of science for all to read, people can read and make up their own minds, I stopped at this website because it appeared an importabt conversation was taking place. Boy was I wrong. The article is titled Is Tropical Milkweed Killing Monarch Butterflies? so one think the question would actually be broached. Instead all we read are nebulous complaints and ad hominens about “purists” (a dog-whistle word intended to describe, not purity but a busy-body who is dogmatic about a subject – which ironically is what you, the author of this article is). You name call people who have presented science, your answer apparently to not being able to present anything in response except your dogmatic determination to do what you like and still try to pretend to have monarchs interest at heart. The truth is you’re egotist. You writing drips with it. Maybe the science about Asclepias Curassavica infecting monarchs by growing Tropical Milkweed where it isn’t native is sound, maybe it isn’t. The good thing about science is that it says what it means, it doesn’t try to embellish, and the moment better data is available it abandons its old hypothesis. I suspect 20 years from now you’ll still be attacking scientist who make you feel like a murderer for the way you garden, when really all it was attempting to do was give you information. Perhaps science doesn’t embellish, but the people asking the scientific questions and interpreting the data do. I can see trying to prevent late egg laying by the monarchs on the tropical milkweeds. I live in north central WI and have seen many chrysalises that became frozen because the monarchs try right up to the end , maybe this is normal and helps to keep the constant reproduction cycles going on during the summers until they migrate. The last ones are probably strong and must need a very strong instinct to get them to mexico, that is if they are some of the ones that do. There may be more to be known than we know yet. THANKS PAUL C. FOR THE INFO ALSO. ps My memory might not be right but it seems that we see monarchs months before we get any caterpillars. Thirty years ago we seen more and earlier caterpillars, but a lot has change in the environment . I feel that if it is not perfectly dry at egg hatching time the eggs do not hatch and that may be part of the problem with our silkmoths also. I should take notes so I can share real info on conditions and effects. I have not found that monarchs lay eggs too late on tropical milkweed in Minnesota. However, I do raise migration generation monarchs indoors because cool nights can slow down metamorphosis. We have been a resource for interested active people wanting to help the Monarch and restore its “NATURAL” habitat for the past 13 years. We help distribute millions of milkweed seeds across North America. Many for FREE. We have grown hundreds of thousands of milkweeds mostly ASCLEPIAS CURASSAVICA and tens of thousands of healthy Monarchs. We ask that before unsupported speculation further disrupts public opinion about milkweeed and the planting of NATIVE ASCLEPIAS CURASSAVICA that writers show real evidence, not just pose question and other’s actions. We are questioned about these types of things weekly by readers of unfinished ideas/ studies. It is the hands down favorite of Monarchs and they can transfer to it from any other milkweed types successfully. Important if your other varieties run out. This alone is reason enough for us to support its use as a just in case food source. 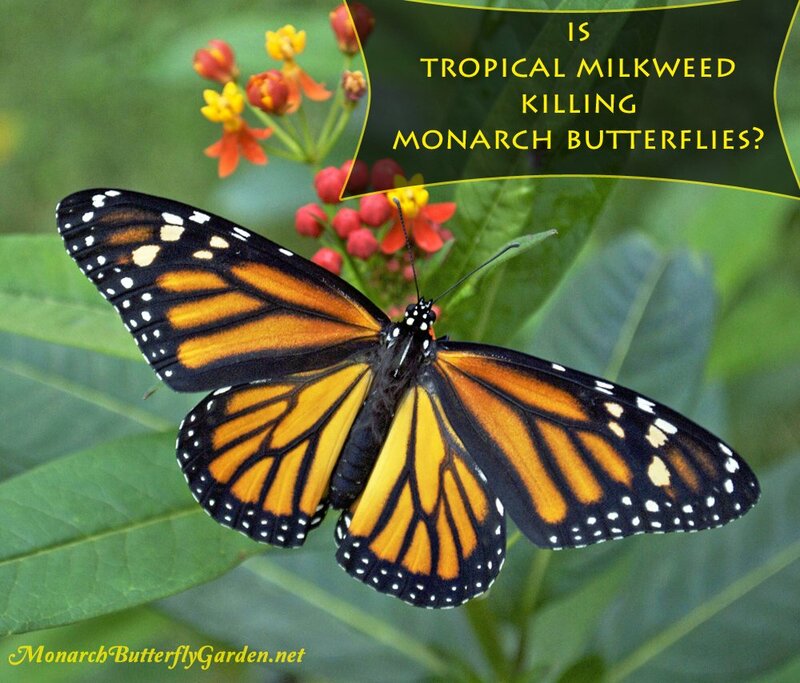 Many milkweed varieties do not support monarchs well or become more toxic over time. Too bad if you are a late larvae and have no alternatives. Many milkweed types are difficult to grow especially from seed… so say many we have heard from, us included. OE exists even without ASCLEPIAS CURASSAVICA. Milkweed is not a cause. OE is spread by the deposition of spores from the butterfly typically attached to the egg not by the plant itself. Some of your readers do not come away with this basic understanding and think the plant is a cause. OE does not attach to a leaf long term unless glued down with the egg. It is dislodged by rain, wind etc. Confined habitat can concentrate spores but this still has nothing to do with ASCLEPIAS CURASSAVICA and is caused by confinement or lack of milkweed on the whole. This plant loses leaves as it grows and no study has shown it to harbor OE more than any other source or surface. Monarchs that are in diapause are not changed and trapped by the presence of ASCLEPIAS CURASSAVICA . To a breeder of Monarchs this is obvious as the larger monarchs at the end of each season do not mate even with ideal habitat full of ASCLEPIAS CURASSAVICA. And temperature may not be the total factor either as in Florida we have warm winters which do not correspond with some ideas presented. Over the years we have modified our message to include the use of Native varieties of Milkweed due to the contacts of well meaning people that read ” Milkweed hurting the monarchs” or the like and we would like to put forth our scientific observation over 13 years. THIS IS NOT THE CASE – WRONG. “Milkweed hurting the monarchs” is just as wrong and confusing to people as using whorled milkweed as a supposed threat to horses and cattle to eradicate all milkweeds for all reasons. But once on the internet these ideas have a life of their own and seem to grow with time. Be responsible with information its misuse hurts us all. Please show your EVIDENCE , PROOF, so we can peer review your findings. Everything has been hypothesized that is just a question without an answer or may still be wrong. Would hate to read about the hypothesis that giving shelter to and feeding the homeless is hurting them too. Wait we have seen science like that lots of times. I wonder if there is a Government sponsored grant for this study ?